For many years, I have been following the blog of a natural dyer, Leena Riihelä, in Finland. This winter she decided to experiment with new dye materials found in her back yard. I have been following her results with great interest and it has inspired me to try a similar process here on the farm. During the 2018 Gallery season, I will be doing a weekly natural dyeing experiment using plants, mushrooms and lichens found here on the farm. I have chosen Saturday as the “Dyeing Day”. I will be using white wool yarn from our wonderful Corriedale sheep. The yarn is spun for us at Blackberry Ridge Woolen Mill in Mt. Horeb, WI. 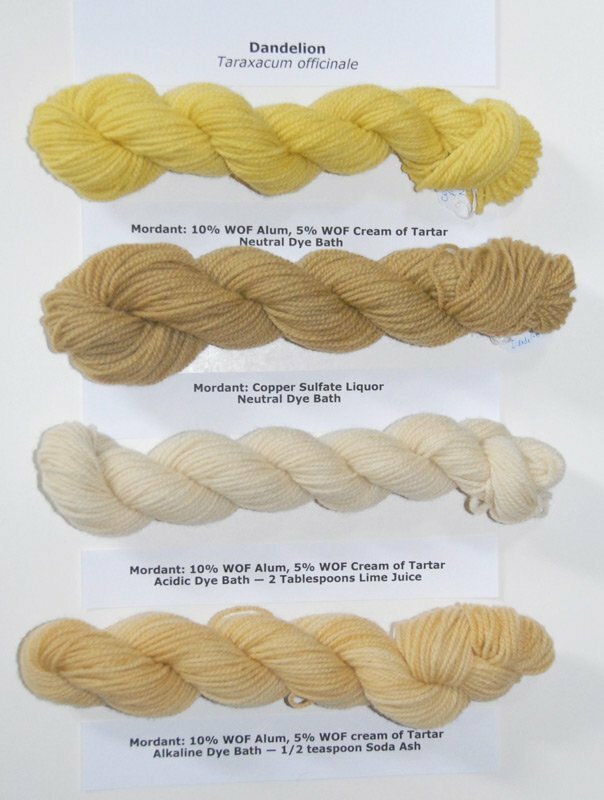 Prior to dyeing, the yarn has been mordanted using 10% weight of fiber (WOF) alum and 5% weight of fiber (WOF) Cream of Tarter. Some yarn has also been mordanted using a Copper Sulfate liquor. Mordanting allows the dye materials to adhere to the fiber. Each week I will prepare three separate dye baths — a neutral dye bath, an acidic dye bath (adding 2 Tablespoons Lime Juice) and an alkaline dye bath (adding 1/2 teaspoon Soda Ash). A small skein of yarn will be placed in each dye bath. The neutral dye bath will also have the small skein mordanted with Copper Sulfate. Each dye bath will be simmered for one hour, the yarn removed, and then washed and rinsed until the water is clear. Based on experience, I am anticipating that many of these experiments will yield shades in the yellow to yellow-green colorways. To create a dye bath, we will need to collect at least twice the weight of fiber in plant materials. More plant material means darker colors. Once collected, the plant material is placed in a fine mesh bag and soaked in water overnight. Plants with large leaves will need to have the leaves cut up into smaller pieces before placing in the mesh bag. The next morning, the soaked plant material is placed in the dye pot with additional water. The pot is brought to a simmer and the plant material is simmered for an hour. At this point, the dye bath is ready for dyeing. However, this season we will be taking the dye bath and dividing it into three equal batches so that we can create the neutral, acidic and alkaline baths described above. The first experiment of the season, May 26th, was Dandelion flowers (Taraxacum officinale). 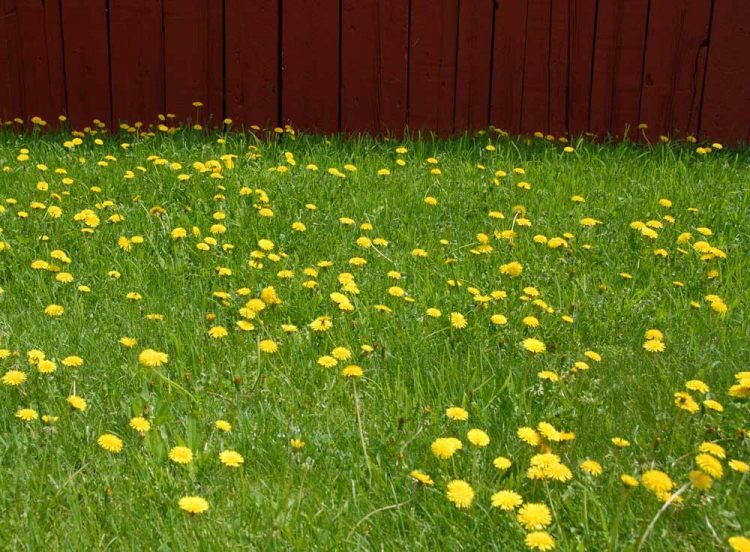 Dandelions have been used as a dye material since the Middle Ages. They have also been used medicinally and the leaves as a food source since early times.The source of the Dandelions was the lawn in front of the large barn. The weight of the four small skeins to be dyed was 110 grams. I collected 220 grams of dandelion flower heads and proceeded to create the dye baths as described above. Pictured below are the results. The neutral dye bath produced a bright yellow as expected with the Alum/Cream of Tarter mordant and a lovely bronze color with the Copper Sulfate. The Lime Juice acidic dye bath produced a soft buttery yellow and the alkaline Soda Ash dye bath produced an orange-yellow. All the colors are lovely. That sounds like fun! And what a great “Dye book” you’ll have. I’ve been saving spent marigold flowers from last summer in the freezer. When you double the fiber weight, are you assuming fresh herbiage? I would imagine that freezer stored flowers or foliage might have a different weight ratio? Or maybe not? I also freeze blossoms to use later. I have a notebook and keep a running tab of the weight in grams as I collect the blossoms as freezing does change the weight. I usually do not use the spent blossoms but try to pick at their peak. It seems to me that more color is available at peak blossom. Good luck and keep on dyeing!